Crystal Cable launches Arabesque Minissimo speaker | What Hi-Fi? After introducing the Arabesque Glass Master floorstanding speaker and Arabesque Mini standmount speaker, Crystal Cable has further expanded its distinctive range with the unveiling of the Arabesque Minissimo. 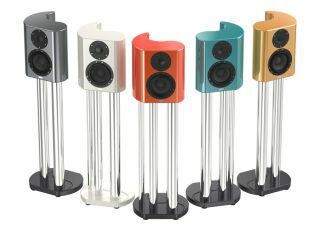 The price tag is a cool £10,000 per pair and the speakers are available in three standard colours: solar orange, pearl white or aquamarine blue. Other colours can be ordered at an additional cost, however. In addition to the Arabesque's trademark curved exterior - designed to enhance the sound quality - the Minissimo model has a new one-piece cabinet construction milled from a bespoke resin/metal mix. Crystal Cable's own Natural Science crossover topology aims to remove crossover-induced distortion, while the speaker features a 25mm beryllium dome tweeter and 15cm laminated paper cone mid/bass driver. A spokesperson for Crystal Cable said: "The carefully selected drivers provide incredible power handling and low compression. The result is a sound that defies the diminutive dimensions of the speaker." The Crystal Cable Arabesque Minissimo speakers will be available in the UK this month. See more on the Crystal Cable website.